Powers/Abilities: Krang was an ordinary ant possessing superhuman size and human-level intelligence, including the ability to speak. 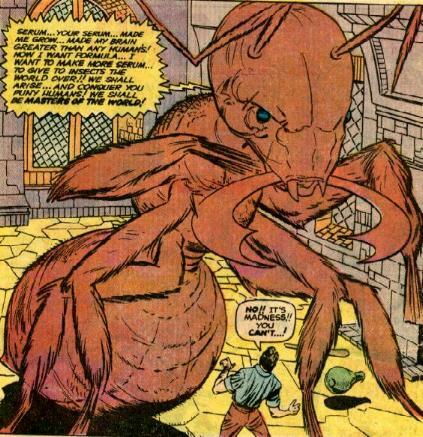 History: (Tales To Astonish I#14)- Krang was an ordinary ant who was used as a test subject by Ludwig, who wanted to steal the growth formula created by Professor Carter. Possessing intelligence greater than any human's, Krang confronted Carter and demanded that he give him the formula. Carter refused, and ran away. In evading Krang, he was aided by Ludwig, but Krang cared only about capturing Carter. Carter escaped the castle where Krang was created and fled to a nearby town, with Krang in hot pursuit. Unable to find Carter, Krang decided to make the formula himself using Carter's notes, but before he could complete it, he was attacked by an anteater which Carter had used the formula upon. The anteater slew Krang, then returned to its normal size. Carter then destroyed his notes. Krang's first big speech is rather laughable. After telling us how his brain is "greater than any humans", Krang proclaims, "now I want formula." Greater than any humans? Yeah, right. With grammar like that, he was our equal at best-- to say nothing of how he spends several pages chasing Carter so that he can get the formula from him-- then remembers he had the formula all along! D'oh! The story was reprinted in Fear#4 (July, 1971) and Weird Wonder Tales#18 (October, 1976). 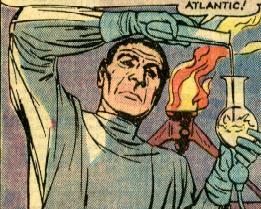 Ludwig was the caretaker of the castle where Professor Carter performed his experiments. 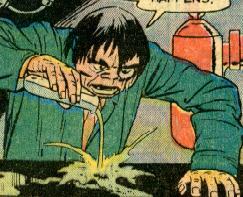 He was jealous of Carter's growth formula, and attempted to steal it himself after testing it on an ant. However, Krang grew far too large for him, and he fell down a flight of stairs trying to get away. Ludwig later rallied his strength, and helped save Carter from Krang so that Carter could find the means to defeat the giant ant. Professor Carter was a typical crackpot scientist, convinced that humanity needed giant insects to solve its transportation problem. Needing the bark of the Krakow tree, found only in Europe, he set up shop in a spooky old castle with Ludwig. After Ludwig accidentally created Krang with his growth formula, Carter evaded the giant ant, to prevent it from forcing him to create more of the formula. To defeat Krang, Carter grew an anteater to giant size, and it vanquished Krang.